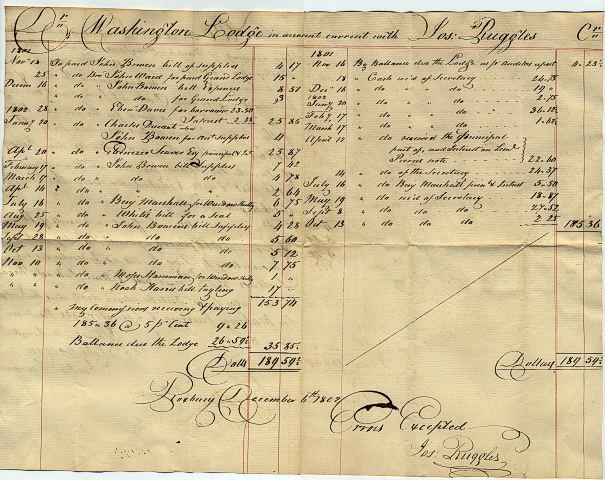 Historic RARE financial statement with Handwritten Auditors Report from the Washington Lodge of the Masons of Roxbury, Massachusetts dated 1802. 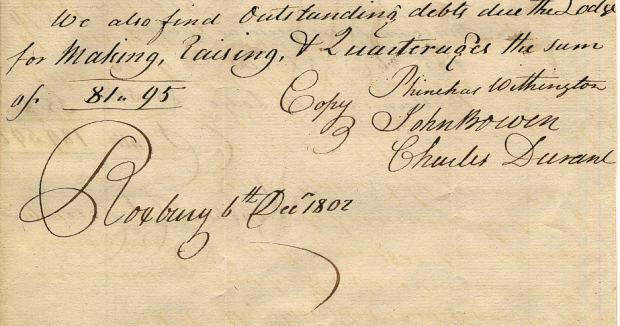 The report and financial statement covers the years of 1801 and 1802. This document has 3 written pages with the front showing the auditors report and the inside showing the financial statements. The back page is blank. Trimmed on edges. Very RARE. We have been collecting for over 30 years and this is the oldest document we have seen that refers to auditors and provides a report. 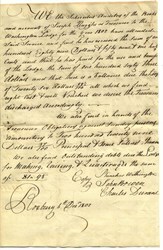 We the Subscribers Auditors of the Books and accounts of Joseph Ruggles, as Treasurer to the Washington Lodge for the year 1802 have attended Said Service and find he has received the Sum of one hundred eighty nine Dollars and fifty nine and one half cents and that he had paid for the use and benefits of thew Lodge the sum of one hundred sixty three dollars and that there is a balance due the lodge of Twenty Six dollars 59 1/2 / 100 all which we find right cast and well vouchers we desire the Treasurer discharged accordingly. We also find in hands of the Treasurer Obligations against Sundry persons amounting to Two hundred and twenty nine Dollars and 37/100 Principal and Some Interest thereon. We also find Outstanding debts due the Lodge for Making , Raising and Quarteruges the sum of $1.95.